I've been enjoying these eco-friendly, upbeat products for a few years now so it's with great delight that I introduce you today to LobotoME notepads and planners. This is likely not the first time you've seen these simple, happy, motivating notepads around. I've spotted them at The Container Store and LobotoME products have also been featured in Real Simple and Cookie Magazine...favorites of mine and yours too I'm guessing. I use the MomME planner daily...I like the way it's organized and sized. 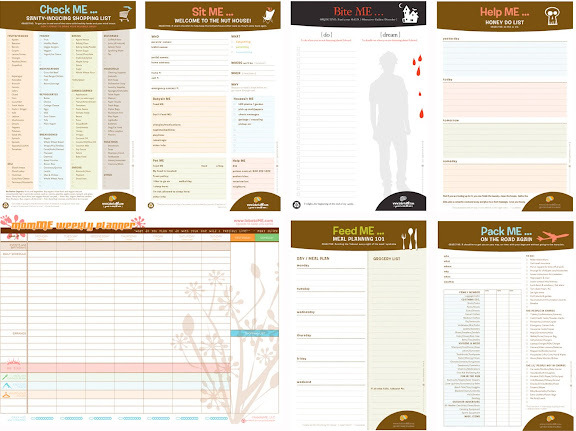 I also love to use the "Sit Me" notepads for my babysitters and the "Feed Me" notepads for meal planning. If you are a Twilight fan (or am I the only one out there that isn't?) you may want to check these out too. I discovered these notepads a little while ago and really need to start using them. I can use all the help I can get when it comes to organizing my life! LOVE these. These are the only planners I use! No, you are not the only one who isn't a twilight fan. I love these, thanks for sharing! I want to completely copy your "opening my closet to you" post. Such a good idea and I've been putting off "put stuff on ebay" from my to do list for months. Haven't read "Twilight." I don't do vampires. . .
ahahaha...i love that you're not a twilight fan! what a funny confession...and neither am i. there's at least a few of us left who aren't! what a lovely set of products! and like a few others, I'm not on the twilight bandwagon. so nice to see that I'm not alone! I am not a Twilight fan. I prefer my real life.